The 35.11 metre sailing yacht Odin has been listed for sale byBurgess. 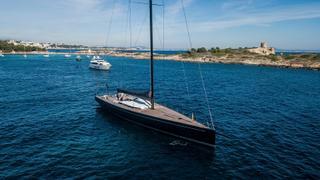 Built in carbon fibre by Finnish yard Nautor’s Swan to a design by German Frers, Odin was delivered in 2018 as a 115’ flush deck model. She comfortably accommodates six guests in three cabins comprising an owner’s suite, double cabin and a twin cabin. All guest areas have Sonos Connect and B&W speakers and there are Sony television screens in both the main saloon and the owner’s cabin while three further cabins sleep six crew aboard this yacht for sale. The interior brief by the yard for de Vosde Vries Design was to create “something different” and contemporary. The interior should have a casual and welcoming appeal, with joinery that put to use the impressive skills of Nautor's Swan craftsmen. The result is a light grey, stained oak wood finish with a brushed treatment throughout. This is contrasted by the dark, crown-cut wenge floors, which are fitted with a distinct cross-plank detailing, created to communicate an industrial tone. Construction is with lightweight foam and carbon cores in order to meet the strict weight requirements to keep this yacht up to her promised sailing prowess. On the technical side, sails are flown on a high modulus carbon mast and boom by Southern Spars with hydraulic upper and lower deflectors and ECSix carbon rigging. Deck gear is by Harken and electronics by Brooks & Gatehouse. Lying in Palma, Spain, Odin is asking €15,000,000.